This page has some information on where you can find Permanent Orienteering Courses in WAOC's area. The club is pleased to have been able to work with the organisations and staff at Hinchingbrooke and Milton to help create and maintain the courses there, and we hope to help create permanent courses at other locations in future. A Permanent Orienteering Course (POC) consists of a map of an area with a series of ‘controls’ marked on it. 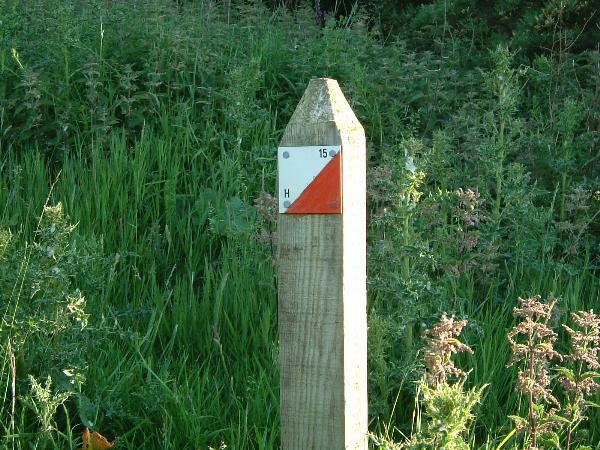 These correspond to control markers on the ground such as posts or orange and white labels. The aim is to navigate around the course, practising map reading and exploring the area at your own pace whether that be walking as a family, jogging with your pet dog, or livening up some run training. Permanent courses are usually set up in areas which are easily accessible to the public, and where there is somewhere such as an information kiosk where you can obtain a copy of the map. (There is a small charge for the map to cover costs of printing and to contribute to maintaining the course). The control markers carry a number which matches the control code on the map (so you know you have found the right site). They usually also carry a letter code. The letter code is not shown on the course map, and can be written down as proof that you found the right location. Information about Ferry Meadows Country Park can be found on the Nene Park Trust website. You can obtain a map from the visitor centre. Details of Hinchingbrooke Country Park are provided on the Hunts District Council website. You can obtain a map from the visitor centre. You can find out about Milton Country Park by visiting the Milton Country Park website. You can obtain a colour POC map printed on waterproof paper from the cafe. If you have had a go at the course at Milton and want to see if you completed it correctly, then see the answers here. There are permanent courses at High Lodge (entry from the B1107 Brandon to Thetford road), and at Brandon Country Park (entry from the B1106 Brandon to Bury St Edmunds road). Maps are available from the visitor centre at each location. More information on the High Lodge POC can be found here. Neighbouring orienteering clubs can provide information on other Permanent Orienteering Courses in their area. For example in Norfolk. Nationally, you can find courses all over the UK using the British Orienteering POC website.